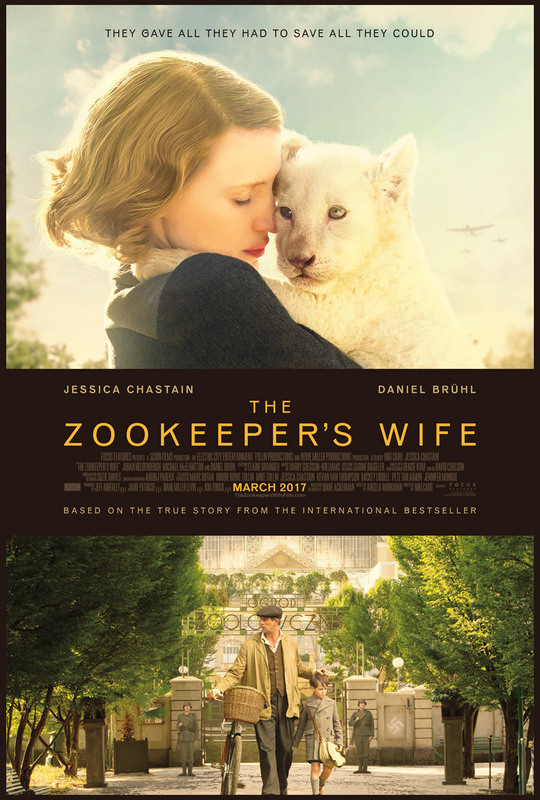 The true story of Antonina (Jessica Chastain) and Jan Zabinski (Johan Heldenbergh), keepers of the Warsaw Zoo, who helped saved hundreds of Jews during the German invasion. The Zookeeper’s Wife is a beautiful looking film. So bright when the zoo is open and thriving, it’s almost idyllic before the Nazi’s invade, Antonina cuddles lion cubs and her son Ryszard (Timothy Radford and Val Maloku) has a pet skunk. Living and working in a zoo almost seems utopian until it’s suddenly and violently attacked. The juxtaposition of the innocence of animals to the cruelty of people can be a little heavy handed at times but there are certain moments of brilliance, like when tigers and lions walk down the bombed streets of Warsaw. There’s a throbbing sense of foreboding once Antonina and Jan decide to try and help the Jewish people who had been rounded up into a ghetto. Every person is a potential threat from the cook, to neighbours and of course the German soldiers who are always on patrol. They have a plan and a system in place but there’s always the threat of discovering hanging over their heads like a guillotine. The Nazi occupation is personified by German zoologist Lutz Heck (Daniel Brühl) who is forever a lurking and watching the Zabinski’s. It begins as a mutual love of animals but his interest soon turns to Antonina causing an extra thread of tension to grow not only between the two of them but also between Antonina and Jan. The themes of love, friendship and loyalty in the face of hatred, which are so often seen in films set in this time period, are no less affecting. This is down to great writing and brilliant performances from all involved. The Zookeeper’s Wife is sometimes a brutal and upsetting experience but there is still hope in the way Antonina and Jan resist the Nazi occupation and their ideologies. 4/5.